This striking residence is a product of impeccable attention to detail combined with high quality finishes. 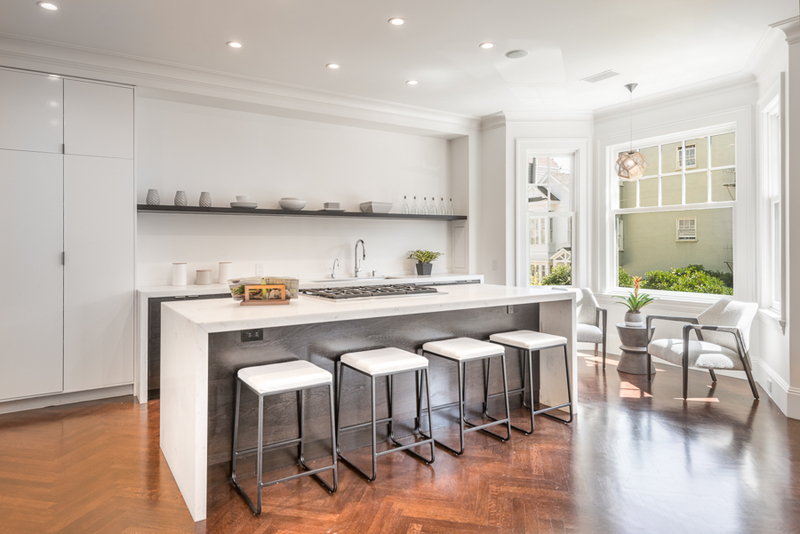 Led by Sutro Architects and Design Line Construction, the property was recently renovated throughout to enhance the architecture and floorplan. The residence features three bedrooms, three and one half baths, and two car parking. Upon entering the private entrance, you are greeted with stunning herringbone hardwood floors, impressive moldings, and designer finishes. To the left of the foyer is the grand-scale great room, which is flooded in southern light and hosts the living room, dining room, and kitchen, allowing for incredible flow between the entertainment spaces. The scale of the living room allows for multiple seating areas and benefits from a stunning wood-burning fireplace flanked by built-in bookshelves as well as views of Sutro Tower. Separating the kitchen and living room is the dining room with ample space for entertaining. 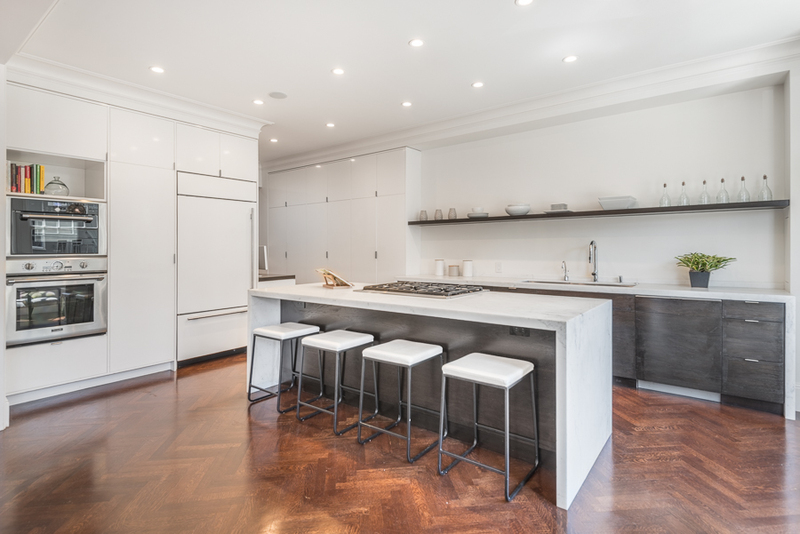 The exquisitely designed kitchen is outfitted with waterfall edge Calacatta marble countertops, custom cabinetry, and high end appliances including a 6-burner gas range and steam oven. Connecting the kitchen and the family room is the office with a built-in counter height desk, file cabinets, and printer drawer, all in the same finishes as the kitchen to create a seamless transition between rooms. The family room is conveniently tucked away from the entertainment spaces and benefits from built-in cabinets, including a nook designed to accommodate a 60” flatscreen TV. Off of the family room, through a series of frosted pocket doors, is a flex space that can be used in a multitude of ways: exercise room, arts/crafts room, or mud room. Behind a barn door is a large walk-in closet with in-unit washer/dryer and additional storage. A rear door provides direct access between the garage and the unit. Completing the entertainment side of the residence, just off of the foyer, is a convenient powder room with a floating vanity and wall-mounted toilet, as well as a large coat closet. Thoughtfully tucked away are the three bedrooms and three bathrooms, two being en-suite. The master suite faces west and has a built-in window seat with drawers, a walk-in closet with custom built-ins, and a serene en-suite bathroom. The bathroom boasts a double vanity with white Calacatta marble, a glass-enclosed walk-in shower with dual showerheads, an over-sized airjet soaking tub, and radiant floor heating. The spacious second bedroom rests on the south-west corner and is bathed in light throughout the day. Down the hall is the second full bath, appointed with white marble floors, subway tiles surrounding the airjet soaking tub, and radiant floor heating. The third bedroom is the ideal guest suite and includes a modern en-suite bathroom with a floating vanity, wall-mounted toilet, and colorful tile in the glass-enclosed shower. The home is full wired and includes built-in speakers in the great room (living room, dining room, kitchen) and family room, as well as a video intercom at the front door, and multiple security cameras. 2876 Washington St is one of eight residences in an intimate building originally constructed in 1903. The impressive shingled façade is complete with dentil molding, brick accents, and well-manicured landscaping. The residence includes two car side-by-side parking, additional storage, and common bike storage. 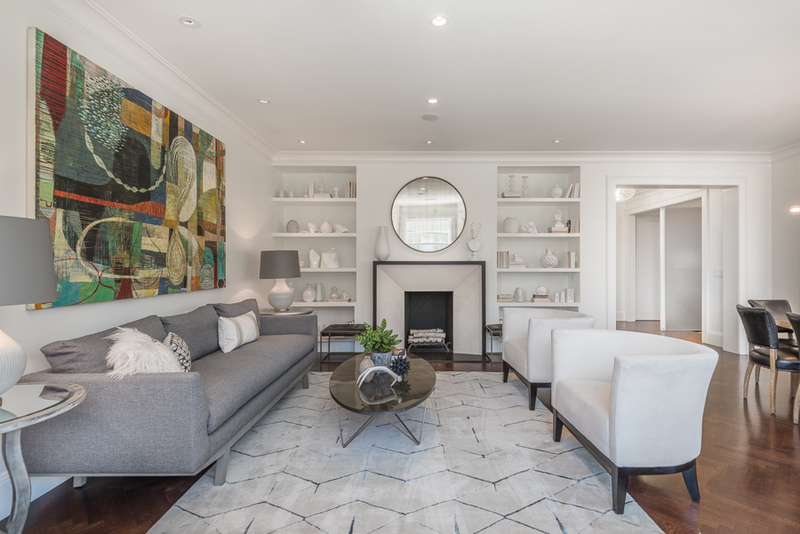 Located in the heart of Pacific Heights, 2876 Washington St is less than a block from Alta Plaza Park, four blocks to the restaurants/shops along Fillmore St, and within three blocks of the commercial corridor along Divisadero St.